I always say to hire a pro whenever you can to perform major work around your home. But the simple fact is, there are some jobs most homeowners are comfortable enough to take care of on their own. I’m talking about smaller jobs like cleaning your gutters or painting the odd wall. One of the main reasons I advocate hiring a pro is because they know how to do a job right – and that includes doing the job safely. If you’re tackling some smaller maintenance projects this summer, here are some tips for the safety-minded, handy homeowner. Just as your toolbox would be filled with your favourite hammer, drill, and measuring tape – it makes sense to ensure you’ve kept your safety kit up to date as well. Before taking on any job, make sure you have (and are actually wearing) the proper protective gear. The gear can vary depending on the job you’re doing, but might include items like goggles, gloves, hearing protection, respirators, and close-toed shoes/steel toed boots. But most importantly, you want to have a fully stocked first-aid kit. That includes, but is not limited to: bandages; sterile gauze; eye wash; scissors; tweezers; instant ice packs; disposable, non-latex gloves; wipes; burn ointment and much more. You’ll also want to keep a list of emergency phone numbers in your kit (doctors, dentists, hospitals, and family contacts), as well as a list of any medications your family takes. Your first-aid kit should be stored in a dry, easily accessible area, and make sure you’re replacing any used or outdated items. Workplaces are required to have fully stocked first-aid kits for their employees, why wouldn’t you also have one assembled at home? Safety on a job site has evolved a lot over the last few decades – you’ll even see those changes reflected in my shows, starting from Holmes on Holmes to our most recent episodes. By law, any worker that uses fall protection on a construction project must complete an approved working at heights training program. The guys on my construction crew and all my home inspectors have this training because the ladder truly can be one of the most dangerous tools on site if not used properly. General ladder safety maintains that you should always have three points of contact on the ladder at all times. When placing your ladder, use the 4 to 1 rule: for every 4 feet you have to climb, bring the base of the ladder out an extra foot. Place your ladder carefully. There are products on the market that provide a stable base to place your latter in, no matter what kind of surface it’s on. When paired with common sense, these can help you prevent ladder kick out. When contractors are on your property it’s important to be aware of what’s going on while they work. If you need a pro to do any major work, always ask if their workers have been properly trained, and that they have liability insurance and WSIB Clearance Certificates. It’s important to identify companies that value the safety of their employees, and a good contractor will ensure their staff remains safe. That will help you know if you’ve found one of the good ones. Even the most careful of us can have an accident on the job site. It’s unfortunate, but it happens. If you have a well stocked, up-to-date first aid kit, you should be able to take care of any minor bumps and bruises that occur. But there may be a few things you’re doing to expose yourself to harm without thinking about it. I don’t need to tell you that caulking is toxic and shouldn’t be ingested, but to get a nice finish on your lines, many users lick their finger and smooth it out. Then when they apply their next piece, they lick their fingers again, potentially consuming harmful chemicals. Instead, keep a bowl of water handy, and while you’re wearing your protective gloves, dip your finger into the water and smooth out your lines. If you’re feeling any lingering pain or discomfort after you have an accident around the home, it’s time to call the doctor. Keeping a well-stocked first aid kit at home is just common sense, make sure yours is up to date this summer and stay safe. 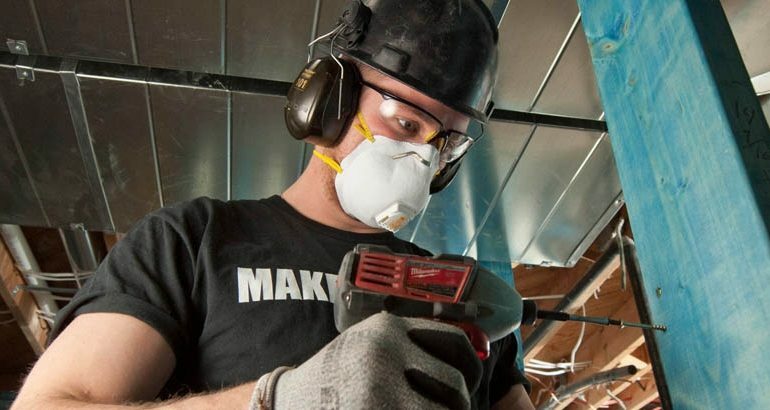 « PREVIOUS Your Post Kitchen Reno Checklist NEXT » Preparing For a Natural Disaster – By Mike Holmes Jr.